Lucky Lake Hostel has been with Hostelworld.com for almost all of their 15-year history, and have proven to be very popular with fans of the great outdoors. 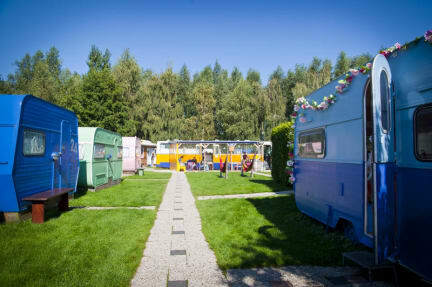 This quirky, kitsch hostel features uniquely decorated cosy cabins and trailers, creatings a clean, relaxed and chilled-out atmosphere. Visitors have told us they particularly like the hammocks, ping pong table and walking around the nearby lake. 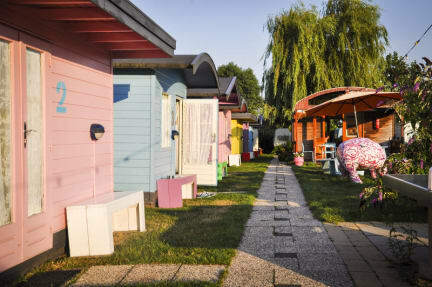 This accommodation located by a lake is made up of multi-colored caravans, cabins and dorms forming a fantastic hostel...you won't believe your luck! 2019: Wonderful Wednesday's all rooms 20 euro per person! Except in July and August. If you are looking for a unique hostel experience, Lucky Lake Hostel maybe just the place for you. As well as offering several wooden cabins, a 4 bed mixed dorm, a 4 bed female dorm, a 6 bed mixed dorm en suite and a 4 bed private room, the majority of our accommodation is made up of caravans, arranged to form a comfortable and cozy hostel and all within five minutes walking of an amazing lake in the beautiful countryside of Holland. Lucky Lake hostel is a one of a kind hostel located in the heart of the Dutch countryside, less than 30 minutes from the city center! Come and enjoy the comfiest beds, friendly and helpful staff, big communal kitchen, beautiful lake, swimming, kayaking, biking and free breakfast and WiFi! Make use of our FREE shuttle service to travel easily to and from the metro stop, from where you can catch the metro 54 into the city, or choose to spend the day laying in the hammocks, playing ping pong, swimming in the lake or ride a bike to the nearby village Abcoude and visit the local farmers market. Combine your experience of this exciting and dynamic city with the peace and space of nature surrounding Lucky Lake Hostel. Breakfast from 7.30 am till 11.30 am in our cool breakfast bus! Smallest and coziest cinema caravan in the world! Please note we do not accept guests younger than 17 years or groups larger than 6 people. We have a 2 night minimum stay. Lucky Lake is one amazing hostel. I've stayed at many hostels, and this is definitely in my top two. It's super clean, the showers and bathroom are shared but are well kept. The staff was super sweet and helpful. A small breakfast included with coffee and sometimes pancakes depending on the day :) The shuttle service was astounding, takes about 30minutes altogether with the metro ride to get to Amsterdam central. All in all, I had the best stay and was really sad to leave this super cute hostel! This place is a simple beautiful .. This was seriously the best hostel experience I’ve ever had—super friendly and helpful staff and relaxing environment! Free breakfast, WiFi, a small shop to buy snacks/lighters/etc, and they serve pizza and toasties until 11pm. One thing I’d recommend is bringing extra blankets/layers if staying during April; it gets REALLY cold at night. Overall, I had an amazing experience, and I’d stay here again! Absolutely incredible hostel. Staff is incredibly welcoming and helpful. The bus to the metro is super convenient. Everything is clean and easy to use. Absolutely would recommend to anyone going to Amsterdam. So happy we decided to stay here. Beautiful location and such well organized and maintained accommodation. Staff were friendly and helpful, especially the irish lady. Couldn't top the experience! Definitely recommend taking the bicycles out for a cycle too! I’ve been to this hostel 6 times in the past 7 years and it has never failed me. (That should be enough to show you that the experience and service is excellent) The staff is always respectful and helpful. Beds are comfortable, food is great... atmosphere can’t be beat. Price is excellent. I’ll continue coming to The Netherlands and staying at Lucky Lake! Life goals- if I could own Lucky Lake when I’m older it would definitely make an investment in this excellent establishment!! Amazing hostel, definitely defined our experience in amsterdam. The shuttle is great and runs frequently. The rooms were bigger than I expected and the facilities were excellent. There wasn’t many variety in the breakfast and I woke up every day with spiders in my bed but that’s because we had a crack in our window that let them in. The toilets were incredible and the hostel also has a kitchen with some food there! I would definitely come back here. Also, free coffee and tea!